In this short episode Shahriar takes a close look at a pair of Hewlett Packard microwave electro-mechanical step attenuators operating up to 26.5GHz. Mechanical attenuators offer excellent repeatability, low insertion loss and nearly limitless linearity. The teardown reveals that the construction of both modules is very similar on the microwave path. 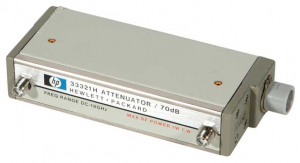 In fact, the lower-frequency model still uses the same attenuator components. The newer model employs electronic control circuity while the older generation attenuator uses purely mechanically controlled DC path. Both models use a solenoid style actuators for step attenuation control.